Some of you expressed an interest in the pattern for the trousers I showed in the previous post. 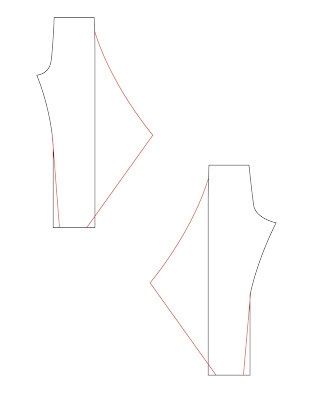 I have made this drawing assuming the pattern has a straight leg, which has to be tapered towards the ankle. For these trousers, it is important to get the length right straight away because hemming any longer or shorter is not easily done. The outward flare starts at about hip level and the point comes at about knee height (or half the length of the pattern piece, which is a bit higher but still OK because it will hang down when worn). Of course, the point needs to be the same at front and back. If you want, you can add in-seam pockets in the side seams the way you would add them to any other garment. 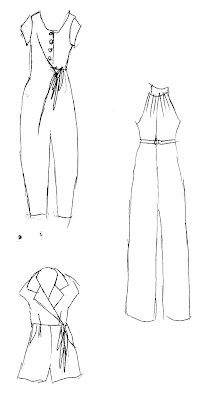 If you are starting with trouser sloper or a normal basic pattern (and you want the trousers with elastic or drawstring like mine), make sure to widen the upper part until it is as wide there as at the hips and add an extra bit on top, as wide as the elastic you will use, plus seam allowance. You will need a rather thin and drapey fabric for this design. As usual: let me know if anything isn't clear to you, and if you make anything based on this tutorial, I'd love to see it, so if you blog about it or post it on Burdastyle, please leave a comment with the link. Really, it is. I know it's been a long time since I've bothered to record any of the outfits I actually wear. But this one is interesting: not only is it all 'me-made' (most of my daily outfits are) it also uses a little-worn old creation as an eye-catching piece. And now, I am happy with it. 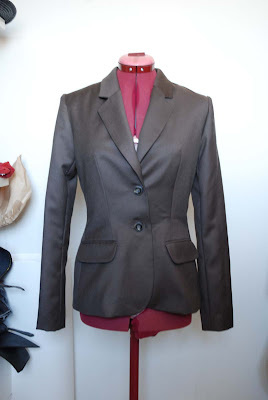 You may recognize my jacket, made with leather from my boyfriend's old coat, and if you are a very dilligent reader of this blog, you may even remember the red top. The item I was talking about, however, are the trousers. I'm pretty sure I made these after I started this blog... but I'm also pretty sure I didn't post about them before. Even though I considered it. This was sort of a Poiret-inspired collection and I just loved the effortless chic of those wide, loose, interestingly shaped trousers. So, I drafted something experimental and tried it out. However, it was hard to find affordable fabric which had the amount of drape needed for a garment like this, and wasn't pure polyesther. This one is viscose/rayon and was only sold in dark blue. Which made it very difficult to fit into my black-heavy wardrobe. So far, it hasn't seen a lot of wear. Yesterday, it occured to me to try again. Viscose is nice to wear in warmer weather and I've made a lot of different tops recently. To me, the red completely saves it. I believe it even allows me to wear it with the black jacket. And indoors with my black version of the tiny shrug. In this picture, you can see the shape of the trousers a bit better. By the way, they have in-seam-pockets. If anyone is interested, I could post a semi-tutorial about them because it would be very simple to make a pattern for these from just about any pattern for elastic-waisted trousers. Just let me know. What to make for the month of June? Just suppose you were to consider this question 40 years ago. 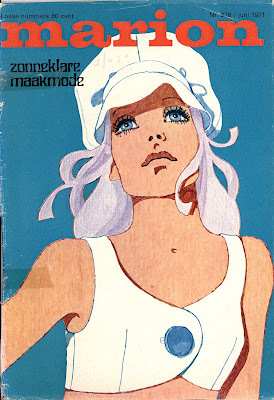 Here in the Netherlands, you could pick up this issue of Marion. 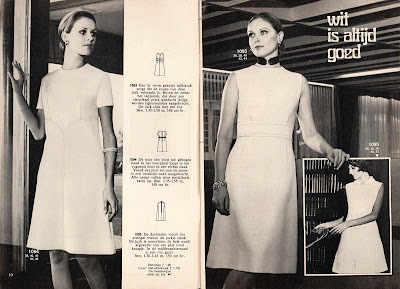 some dresses with clean lines, which came with the recommendation to make them in white. Seriously, does anyone recall a summer when white was not an 'in' colour? The month's trend item was a choice of midriff-baring trouser-and-tank-top sets, made in stretchy crushed velvet. 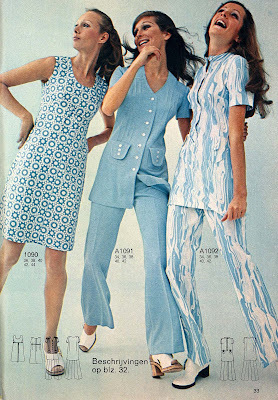 and tunic suits were hip for day and night. And of course, the children weren't forgotten either. 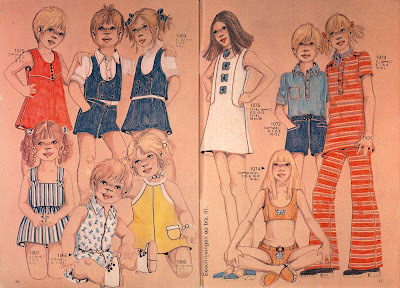 After all, what would 70's Marion be without some scary drawings of kids? After two jackets, with work getting crazy and more than one labour intensive project-for-someone-else in the pipeline, I really felt I needed some quick, selfish bits of sewing just to keep my spirits up. I also had this black knit which I bought on sale at the market for 0.50 euro a meter. And in my mind, nearly free fabric equals licence to experiment. These two quicky projects may not be my most exiting experiments by a long shot, but they were quick, they kind of fill a gap I had in my wardrobe and I would have hesitated to waste good, expensive fabric on them. Oh, I know I'm using black again, but this stuff was cheap... And there will be plenty of colour this summer, I promise. First, about a week ago, I made this top using the basic shape I created for the colour block top. 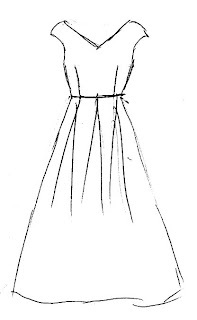 This one has a normal shoulder seam and a wide, straight neckline at both front and back. Because I really didn't like the look of that, I made three horizontal pleats just below the neckline at center front. I like the resulting look a lot better. It's a nice top when it's worn tucked into a high waistband. I don't care for it worn over anything. Secondly, I made an open-fronted shrug of about waistlength. In my wardrobe, that's a nice layering piece for 'in between' kind of weather. 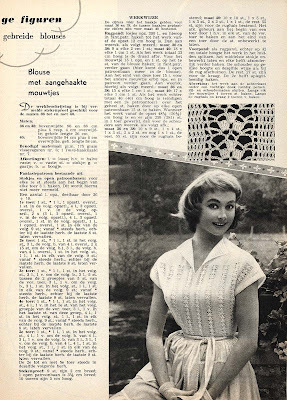 I used my slopers to make the pattern but if you wanted something similar, you could download Tanit-Isis's shrug pattern and cut away some of the front in a curved line from the neckline's shoulder point to the front waistline. Yeah! I can post again. Blogger wouldn't let me in for a couple of days (It also still won't let me comment on your blogs quite frequently). Thank you all so much for your nice replies to my planning-and-explaining post. I am always interested in how other people's creative processes work and I'm very happy with your support for me and my sewing and blogging ways. I think I will devote a post to 'approaches to planning' later. And I still stand by my resolution to make another pattern available as soon as I have the time. At the moment however, work is crazy, so on my one day off this week, I won't be writing much. I wanted to show you this jacket, which I made for my friend J. It fits her an awful lot better than the dummy. Which it should because I drafted the pattern especially for her. She also picked the fabric and buttons and decided on such styling details as length, collar depth and pocket style and placing. She came to pick it up on Thursday (just after I took this picture). I was a bit nervous about the final look and fit. We did have a fitting before I attached the lining, but I'm always worried about details not working out. When I put it on, one of the sides was twisting in which made me think I had made some small but terrible mistake in attaching the facing. I gave it a final pressing and when she put it on, there was no problem and she loved it (by the way, she payed me to make this jacket, so it really should what she wanted it to be). Succes is sweet. At the moment, it seems like we, in the Netherlands, will skip spring altogether this year. We went from cold winter-on-its-last-legs to summery warmth in what seemed like just a week. So, if you wondered why I never formulated any spring sewing plans, there's one of the reasons. At least that cold I had last week is almost gone now. The other, maybe even more important, reason is that I find it hard to communicate my plans. Because I make my own patterns, my sewing plans can be pretty changeable right up to the moment I start drafting. Of course, that hasn't stopped me from sharing my plans before but it adds an extra challenge. I'm not good at sketching. I usually draw a few rough lines with the aid of a technical croqui. I can make proper technical drawings in Illustrator but that takes a lot of time. Time which, at the moment, I either don't have or would rather spend sewing. re put off (put off commenting or even put off reading) by bloggers who make their own patterns. They feel kind of left out because even if the garment makes them think "I want one of those" they can't get the pattern. I can relate to that, but not so much that it makes me change my ways. As much as I love getting comments, I don't think anything could make me give up on drafting my own patterns. I will, as I have before, try to make how-to's of those projects which don't really require personalized slopers or advanced pattern making skills. It's a lot of work, but I think it is also a nice way to share some of my projects (and I especially love it to hear back from those of you who used my how-to's). When work gets a little less busy, I am planning to make a tutorial or a (on Burdastyle) downloadable pattern of the loose fitting top I made recently. Well, on to those plans then. I addition to the issues I raised above, I also think it is almost impossible to do any justice to a piece of fabric in a photograph. However, these are four fabrics which I intend to use soon. From left to right, the blue and white print is fairly stiff cotton. It is actually a kimono-like garment, put together from narrow uncut lengths of fabric. I plan to make a fitted dress from it, but I don't have a sketch I'm really happy with yet. The second one is a dark blue silk blend of which I want to make either the jumpsuit sketched on the right or a complete rip-off of that YSL one. The two other sketched jumpsuits are more hypothetical. There's a 50's-style playsuit which might be nice in cotton or linen. 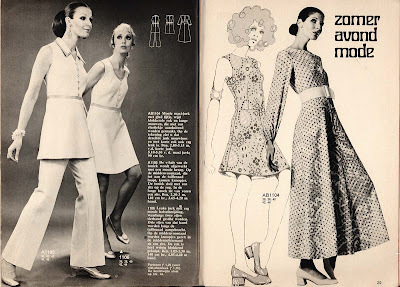 And there's a rather serious pattern making challenge: a jumpsuit in which one would use a fold in the fabric to close it and bring in the shape. The third fabric is a textured cotton I bought last year, with a bold print. I want to make another big skirted dress from it. I know I probably already have more 50's dresses than I need, but I love them and I think such a design would suit this fabric very well. The fabric on the right is a slightly heavier beige cotton. I want to make trousers from it. One pair high waisted with straight or wide, long legs, the other one belt pleated and tapered with a front fold which is also used as the closure (sorry, no pictures). As usual, there are many more things I would like to make, several of which I need in my wardrobe more than any of the above and added to that there is stuff I promised to make for other people. So, we'll see what gets done. But these are all things I want to make. What about you? Do you plan by chaos theory, like me? Anything you're specifically interested in right now? Reactions to my earlier vintage-magazine-posts have been somewhat luke warm, but I am going to go ahead and bore you all with another one anyway. And this one doesn't even really involve sewing. To tell you the truth, I don't have anything else to show at the moment. This week, I have my worst head cold in years and four days of work which really could not be done by anyone else... There hasn't been any energy left inside me for sewing or interesting sewing-related research. So, I will show you what's inside one of those magazines my aunt gave me last week. This publication has a rather un-inspiring name which translates as "Monthly magazine for crafts"... Ok, at least it is what it says on the tin. And it is full of lovely pictures. 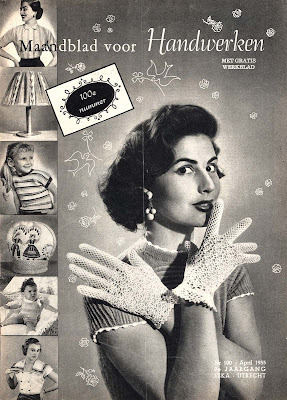 By the way, there are crochet and knitting patterns inside for those lacy gloves. 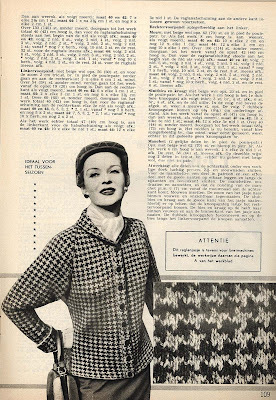 It includes several patterns for intricate knit- and crochetwear for ladies. Dutch readers may notice the half texts in my scans. This is an A4 size magazine, so I can only scan single sheets at a time while the magazine design is per spread. This particular spread had a knit top at the left side and a crochet top, this one, on the right. 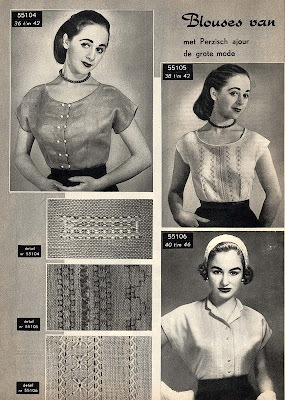 The sewing patterns for these blouses were avaible by mail order (for 25 cent a piece) but the main focus of this page is their decoration. The magazine calls this 'persian ajour' and it is a kind of thread pulling and embroidery technique. The counting patterns for it were on the (now missing) work sheet. I think my grandmother has a table cloth (which she made herself years ago) with this kind of decoration. Of course it's not all women's wear. Through the ages, proper housewives used to sew for everyone in the household except the grown-up males, didn't they? 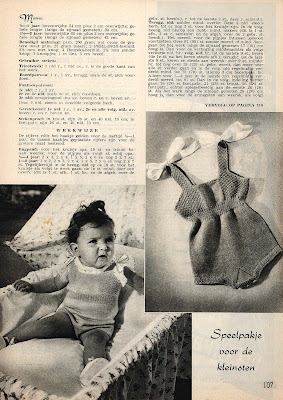 So a play-suit for a baby would definately be on the list. Back to sophisticated ladies' wear now. 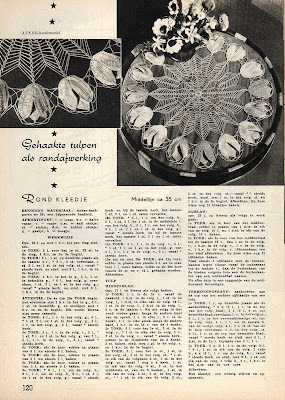 This looks like something one would sew but it is a knitting pattern. I do not know what endlessly high level of skill, patience and precision is required for it but here are the instructions to knit a hound's tooth check of reasonable size and make it work in the shape of a raglan cardigan. 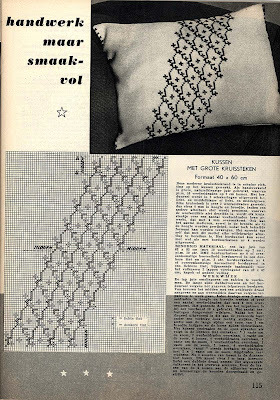 And you could make things for around the house as well, like this cross-stiched pillowcase. They claim this is an easy project. This round lace tablecloth seems anything but easy. It is made in a technique which involves a crochethook. But interestingly, the tulips at the edges are described as being crochet-work, the lacy bit in the middle is not. Anyway, it's all about very thin yarn, tiny stitches and endless patience. I have to give my respect to the older generation of women who could, apperently, do all this stuff. I have done a little bit of knitting and crochet but I can't begin to think of most of these projects as even remotely achievable.